In a former life, I spent my days working in broadcast production while living in Minneapolis, New York, and Los Angeles. I now reside with my husband, Richard, and our son, Geoffrey on our centuries-old family farm in the southwest of Ireland. Farmette is a diary of my adventures in starting over from scratch, embarking on a second life where nearly everything that made up my former identity was replaced with a new set of circumstances complete with a pair of wellies and a whole lot of muck to trek through. It is a blog about leaving behind a career, a city, a nation and a slew of family and friends when I fell in love with a man, a son, a farm, a country and its traditions….and perhaps most prolific: finding my way around an Irish kitchen and becoming a bonafide cook in a world where traditional trumps quick or convenient. 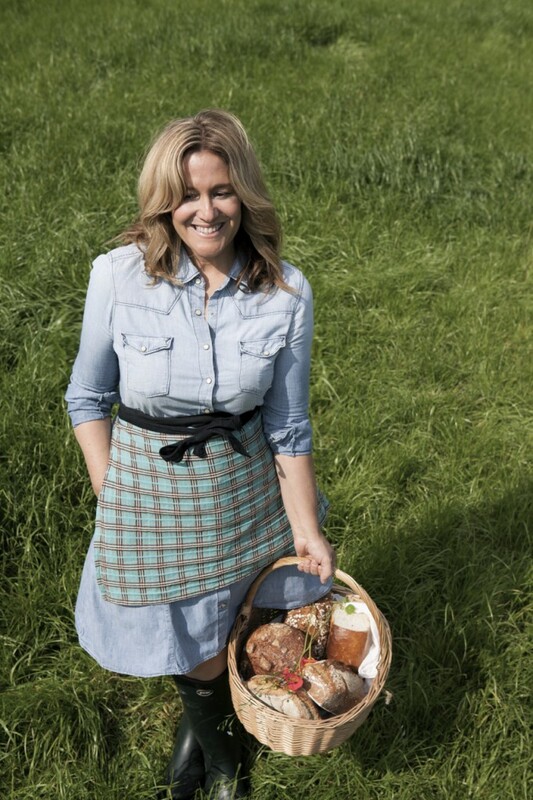 My first book, The Farmette Cookbook, Recipes & Adventures from My Life on an Irish Farm was published by RoostBooks and distributed by Penguin/Random House in the USA, Ireland & UK, March 2016. It is available for order here and here and here. Farmette has been featured in Saveur Magazine, Food and Wine Magazine, The New York Times Diner’s Journal (here and here as well) Food52, Spenser Magazine, Apartment Therapy, The Huffington Post, Image Interiors & Living, The Irish Times, The Sunday Independent, The Sunday Times UK, The James Beard Foundation Blog, The Irish Times, The Foodie Bugle, The Kitchn, Sweet Paul, Dean & DeLuca Gourmet Food Blog, Wayfare Magazine, The Los Angeles Times Daily Dish, RTE Radio 1’s Countrywide, Foodie Crush Magazine, RTE Radio 1’s Marian Finucane Show, The Irish Examiner, The Irish Daily Mail, The John Murray Show on RTE Radio 1, Newstalk with Sean Moncreiff, Irish Tatler magazine, Easy Food Magazine, and RTE 2FM’s Dave Fanning Show. If you fancy, you can read my weekly column, “Tales of A Modern Farmette” in Irish Country Living/Irish Farmer’s Journal each Thursday or my quarterly piece in Irish Country Magazine. I also contribute to Condé Nast Traveler, sharing travel + food stories when I can break away from the farm for a spell. Follow on Twitter @ModernFarmette visit my Facebook page, Pinterest boards or Instagram feed. Alternatively, if you wish to make contact directly, email me at imenmcdonnell@gmail.com or fill out the form below and I will be happy to get back to you as soon as I can. My name is Elisha and I am one of the Producers on The Restaurant this year. We are in the process of reaching out to food blogger and the general public who are big foodies. I would love to talk to you about the possibility of coming along to one of our shows. If this is something you might be interested you can call me 0863099815 or via the email above. I lived in Ireland for a year, back in 1970, and met my (now ex-) husband there. Although I’ve traveled to over 70 countries, Ireland will always be my favorite and closest to my heart. Our newspaper here in Spokane, Washington had a St Patrick’s Day contest which I entered. We had to tell about our favorite Irish food and I wrote about Potato Farls. I know they’re technically from Northern Ireland, but I was addicted to them during the year I lived in both Belfast and Dublin. I won one of the six cookbooks they were giving away and was amazed when I received your Farmette Cookbook. I sat down and read it from cover to cover and it was the most enjoyable time I’ve had for quite some time. Admittedly, I’m a cookbook-aholic (with will over 8000 in my collection), but I will treasure your cookbook and will now also be a loyal follower on your blog. Thank you so much! What is it about those Irish boys? I am prepping at the moment to move myself and family to my husband’s home to be with his family in Donegal. I was looking for fellow ex-pat’s blogs to get a sense of what I was getting myself into. 🙂 I look forward to trying some of your recipes! One of my dreams is to ride a bike through the Irish countryside (but maybe only for a few miles… then a charming Irish man would drive me around for a couple of hours). Lovely blog! I found your blog via bloglovin’, and I’m excited to look around. I’m currently trying to combine your “two lives” here in the US…I love your photos! Hi Imen! I just stumbled across your blog via Mimi from Manger and I’m hooked! I lived in Galway City for a semester in college so I’ve got a soft spot for the Irish 🙂 Now I find myself living in Germany which is a different type of soft spot as I came over on the love boat so I know what it’s like to leave home for someone you love. Thanks for writing! I stumbled upon your website a few weeks ago and it feels like home. I also married an Irishman, but dragged him to an island on the NW corner of the states (from Manhattan) to start our own little farmette. Your posts feel comfortingly nostalgic and remind me to make soda bread more often (instead of salmonberry jam with home started sourdough). I only wish I has some home spun butter ! I see cows on the horizon. I’m a up and coming blogger and I just wan’t to say that you truly motivate people like me keep up the good work. Make your own butter. Anyone can do it. I think your son is the brewer? Thanks for your nice message. Perhaps I will meet you this summer. We love Milwaukee! Just found your blog on “Irish Abroad website. I love it. I left Ireland as a young married woman with three children waaaay back in the sixties. l now live on the East coast of the USA. Love your chat, sense of humor, recipies and photos of my home country. Will definetly be a follower. Hello. I am from St. Paul Minnesota and I also married a farmer. I now live in County Kerry. My husband heard you on the radio. Me too, I didn’t travel so far (from Cork) but I didn’t see a cow until I married my Kerry farmer! It’s great to hear from other ‘fish out of water’! No matter how incredible and lovely a life it is; it doesn’t come without challenges! Loving this blog girls! In my excitement to praise you for your wonderful blog, I inadvertently sent a message instead of a post! But, I do very much enjoy your blog and remembering my own time spent living in Ireland. I hope that you will continue to keep the world posted about your Irish adventures. They are marvelous, as are your beautiful pictures. I hope you will check out my blog and read about some of my own memories, many of which take place in Dublin! Imen – congratulations on being featured in the Irish Examiner today – I’m a fellow American – moved to Nenagh in July 2007 and have been blogging since April 2009 – must be something about living in Ireland! Your images are absolutely beautiful – I’ve heard about your blog but never actually found my way to it. Now I’m hooked! I’ll be back! Thanks so much for your comment. I grew up in a very small town just two hours north of Mpls. My love for that state can’t be contained 🙂 Very excited to explore all of your blog — your stories and recipes are amazing and lovely! Very entertaining reading, lovely receipes and photos. Great to hear about Irish life from an American point of view! Hey, stumbled upon this website & blog from listening to someone at a party friday last talk about your interview with Dave Fanning, I came home, googled you & find it. Love it. Very interesting & very funny. Must read some of your recipes. i just discovered your blog… well not just, a few weeks ago but i didn’t have the balls to comment til now. so anyway…. hi!! i will definitely keep coming back, you have such a funny and fab blog! You have a fabulous, funny blog! I love to pop-in and read your posts. British Feature Fiction Film ‘BILLY & LILLY GO TO NEW YORK’ will have its World Première at the WATERFORD FILM FESTIVAL. The film is made by critically acclaimed maverick director Bill Maloney (LUNATIC) The film is shot in a realistic documentary style but it is a spoof. Bill playing himself (a cockney –speaking Irishman) goes to New York to represent his nominated feature film at a NY Film Festival but he decides to bypass the festival glitz in favour of shooting a documentary about the homeless people of NY. Their efforts lead to a tragic close. It would be great to see you at the Festival if you can make it – or tell your friends who live nearby?